As you probably already know the Boagworld Podcast has been on hiatus for the last six months. However with the relaunch scheduled for January, a Christmas special seemed like the perfect way to introduce its return. As is the tradition our christmas special is long and rambling with lots of christmas gift ideas and reading material. However instead of boring you with all of our inane prattling I thought a simple blog post outlining what the new show will be like would be much more useful. For everything else you can listen to the show. When is the show returning? The date you need to mark in your diary is Thursday, 27 January. This is when we will launch the first show of what we are now calling season one. However you may also wish to make a note of Thursday, 20 January. This is when the I will be launching season one with a 40 min free video webinar that will provide an overview of what the season will contain. Places for this webinar will be limited so be sure to sign up below if you wish to attend. You will notice that I referred to season one. This is because we have decided to move away from the continual weekly format. Instead we are going to introduce seasons much as you find with TV programmes. Each season will consist of six weekly episodes as well as the webinar introduction and a live episode at the end of the season. Each season will tackle a single topic. Each episode will deal with one aspect of that topic. Together all of the episodes in a season will provide a comprehensive view of a particular subject area. We will also be releasing an e-book and video to accompany each season. What’s this about a book/video? Much like many TV programmes we intend to release a book to accompany each season. The idea is that the book will go into more detail on the subjects we cover in the show. With each episode only lasting 30 minutes we will be limited on how much depth we can go into. However each episode will have an accompanying chapter in the book that will delve deeper into the subject being discussed. In order to keep costs down we will be releasing the books in electronic format only. They will be available both as a PDF and epub. This means it should be viewable on everything from an iPad to an Android phone. Finally we also intend to release a video of the webinar as well as all the slides used in the presentation. Although this presentation will only give a top level overview of a season, it is perfect for showing clients, internal stakeholders or senior management. These are the kind of people who will never listen to a six week podcast but who could really do with hearing about the topics we cover. What will the first season cover? The first season is going to look at the subject of “building websites the return on investment”. We believe that both website owners and web designers need to look more closely at the financial justification for their websites. This is especially true in the current economy and this season will look at tangible ways you can judge whether your website is successful or not. The season will also recommend ways that your website can generate a greater return on investment and justify further development in the future. What will future seasons cover? Our aim is to release 3 to 4 seasons per year. Some seasons will be primarily aimed at website owners while others will be aimed at web designers. For example building websites for return on investment is a topic of particular interest to website owners. However our second season is going to tackle the working relationship between clients and web designers. This is probably of more interest to freelancers who struggle working with their clients. To attend the introduction webinar please complete our signup form. Only sign up if you are sure you can attend as places are limited. Can I still listen to old episodes? Yes, you will be able to listen to all 215 original episodes of the podcast. These will be available both on the Boagworld website and via iTunes. These original episodes have been renamed “Classic Boagworld” in order to differentiate them from the seasons (Think Classic Doctor Who vs the revamped show). 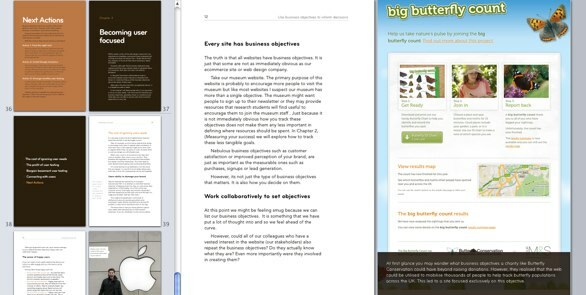 Also do not forget the daily web design tips I record using AudioBoo. these are available both by following me on Twitter and through iTunes. Lanyrd: Lanyrd helps you get more out of conferences including what to attend and catching up on everything you missed. PInterest: Pinterest is a place to catalog the things you love. Its currently in closed beta but we have 75 invites to give away. Get them quick. Firebox: Firebox has a great selection of weird and wonderful gifts for the geek in your life (or yourself!). Not on the Highstreet: Not on the Highstreet is a collection of hundreds of small retailers. Etsy: Etsy is a wonderful collection of handmade products from a range of artists and crafts people. It even has a geek category. Damn you autocorrect: Damn you autocorrect is a hilarious collection of iphone txt messages where the autocorrect has changed the meaning. Regretsy: Regretsy is the fail blog of hand crafts. Enough said! Enjoy and have a wonderful christmas!